Please refer to our stock # mg4 when inquiring. This fantastic cuff bracelet was made in the pate de verre technique originated by Maison Gripoix. 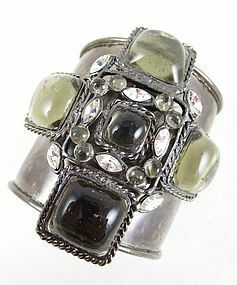 The silver tone hammered cuff is 2 3/4" wide and the 3" wide pate de verre applied maltese cross has glass and rhinestone accents. It has a 5 1/2" interior end to end measurement with a 1 1/2" gap opening, and the metal has flexibility to adjust to most average wrist sizes. It has no markings and it is in excellent condition. Please see my other listings for the matching earrings (sold separately).